Why Choose Saint Rose for Inclusive Early Childhood Education? Early childhood educators get us started on the paths that we continue throughout our lives – who doesn’t remember his or her first teacher? 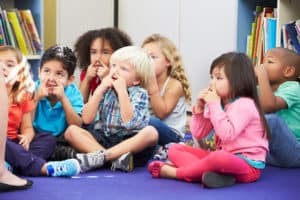 And, with the ongoing teacher shortage across the United States, early childhood teachers are finding their jobs to be secure and financially rewarding as well as personally fulfilling. If you aspire to help young children learn, develop, and reach their potential, our Inclusive Early Childhood (IEC) Education program is for you. At the College of Saint Rose, we produce skilled, highly qualified teachers for general education, special education, and inclusive settings that serve children with a full range of abilities and needs. You’ll work closely with dedicated, distinguished faculty who integrate perspectives from general and special education and help you link content with theory and practice. You’ll work with your professors and peers through our program, which strategically combines coursework and coordinated, supervised fieldwork. By your junior and senior years, you’ll have developed solid leadership skills and a strong identity as an early-childhood professional. You’ll graduate a confident, capable educator ready to serve the cognitive, academic, social-emotional, and communication needs of a diverse population of young children.